The planning and design of an air piping system are crucial steps to ensure optimal performance of pneumatic equipment and tools. In order to improve your knowledge of compressed air and guide you in your projects, we provide you with reference guides and instructional videos on compressed air systems. We provide turnkey solutions for all kinds of applications, from large manufacturing and industrial facilities to small workshops. Whether you need technical assistance or advice, our technical team is available to help you reach superior performances and the highest level of safety with your compressed air piping system project. Download our white paper and learn more about planning and design a compressed air system. This practical guide offers you some ideas for planning your compressed air network. By having an optimal system, your tools and equipment will be more efficient. An overall plan of your compressed air piping system to visualize your installation. It can be realized on request. A detailed list of drops with their references are available on request. 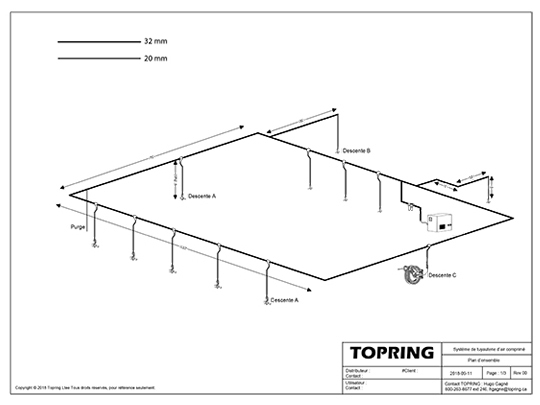 These drawings are offered in 2D and 3D CAD format. 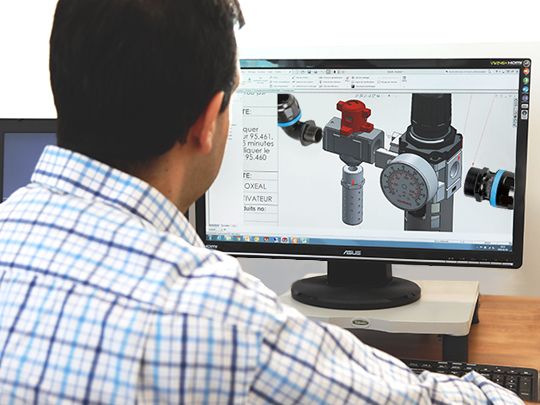 Learn more about the design and planning of each of our compressed air piping systems.